Source Management is the core page of the platform that provides you with an opportunity to quickly analyze and optimize the campaign performance based on disposition data for each source presented on one page. You can easily correlate performance and compliance with sources and make more informed decisions. Track the ROI % and CPA by each source, publisher, site and traffic type in the platform. 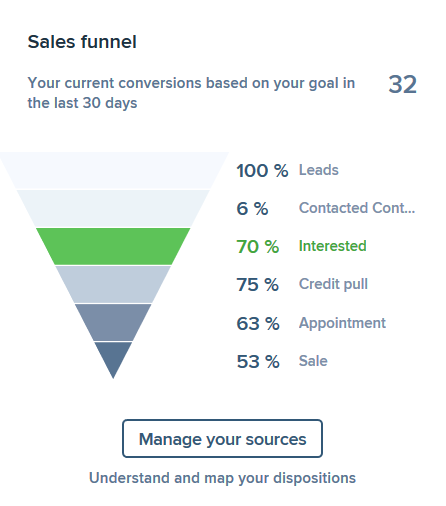 You can also view the sales funnel graph, add payout rules and set daily capacity and budget either for the whole campaign or for specific sources, straightaway from one page. Buyers that regularly upload disposition data will make the most of source management. Source Management page includes the brief description and the date when the last disposition file was uploaded (if there was any). Click Site Management to view Site Management page. The table can be sorted by columns. Click any column heading to sort the spreadsheet down, click one more time to sort it up. 1. Type - the traffic type of this source configured in publisher settings. 2. 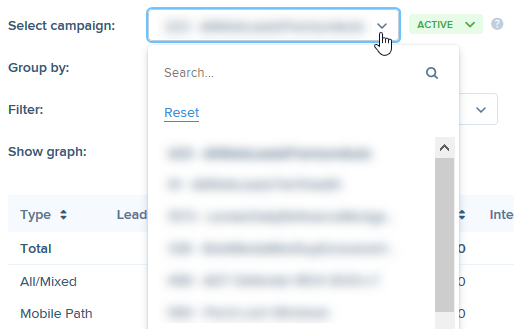 Available leads - the number of available leads from this source in the campaign vertical. 3. Daily budget - the maximum daily budget amount for a specific traffic type, publisher or site. 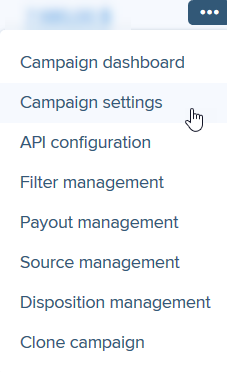 Total row shows the maximum daily budget set in campaign settings. 4. Daily leads cap - daily leads capacity for a specific traffic type, publisher or site. Total row shows the maximum daily number of leads set in campaign settings. To edit total and source-specific budgets and caps, follow Manage Daily Volume in Source Management article. 5. Leads - the number of leads bought from this source during the selected period. The next 9 columns are based on uploaded disposition data. Some of them are not displayed by default and can be selected in column settings. If certain disposition status was set as a goal in campaign settings, the corresponding column is marked with green (Credit Pull column on the image above). Disposition columns can have different names according to configurations for this vertical and country on Disposition Naming page. 6. New - the number leads with New status uploaded in disposition files. 7. Contacted - the number leads with Contacted status uploaded in disposition files. 8. Interested - the number leads with Interested status uploaded in disposition files. 9. Credit pull - the number leads with Credit Pull status uploaded in disposition files. 10. Appointment - the number leads with Appointment status uploaded in disposition files. 11. Sale - the number leads with Sale status uploaded in disposition files. 12. ROI - returns on investment of the selected campaign. Follow How ROI is Calculated article for more information. 13. CPA - calculated CPA based on disposition files uploaded. Check details about CPA in Buyer Performance Report. 14. CPL - average cost per lead from each source (traffic type, publisher or site, depending on the grouping selected). CPL is calculated as the ratio of total payout for leads from this source to the number of leads bought for the selected period. N/A - there isn’t enough leads from this source to assess the quality. 1. Site<!--[endif]--> (for Sites and Sources)- the logo of the site uploaded on Sites admin page. Click the logo to open the website in a new tab. If the logo is missing, hidden or the website is Unknown - a default logo is displayed. 2. Source ID (for Sources only) - the ID of the source that consists of site ID, publisher ID and the last 3 characters of sub ID. 3. Publisher ID (for Publishers only) - the unique ID of the lead publisher. Paused - the source or corresponding site was paused by the buyer and no traffic will be received from it. On - all sources that were neither paused nor prioritized in All Sources mode and for sites that are On for this campaign. Off - sources that are neither paused nor prioritized in Selective Sources or Campaign off modes. You can pause/unpause and prioritize/deprioritize sources. Active - All sources - the campaign is connected to all existing sources. It means that all leads from all publishers and sites from the corresponding vertical will be proposed to this campaign. You still can pause sources that are not relevant for this campaign. Active - Selective sources - the campaign is active but disconnected from all the sources, but you can prioritize relevant sources and the campaign will get traffic filtered according to your priorities. If you want to receive all traffic, make sure you select All Sources. If you want to specify each source you want to receive, choose Selective Sources option. Inactive - Campaign off - the campaign will be paused and disconnected from all the sources. It stops receiving traffic until you select one of the active modes. By default, each newly created сampaign is set to off. Select All sources and pause sources that aren't relevant. Select Selective sources and prioritize sources that are relevant. When you change the campaign status, please wait until the confirmation pop-up is fully loaded and closed (maximum 7 seconds). This time is necessary for notifying all related platform components about this change. Updating all PX reports after campaign status change may take up to 15 minutes. Sources – the table is grouped by source ID with options to pause/unpause or prioritize/deprioritize the particular source. 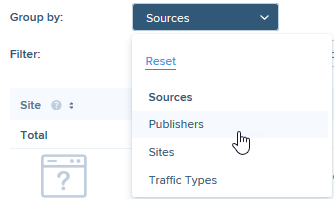 Publishers – the table is grouped by publisher ID with options to pause/unpause or prioritize/deprioritize the particular publisher. Sites – the table is grouped by site ID and you can pause or unpause any site. Traffic Types – allows analyzing campaign performance based on specific types of traffic. The page can be also filtered by date, source statuses, and publishers. Select one or several statuses and publishers to view the most relevant information. Filtering by publisher isn’t available if the table is grouped by sites or traffic types. 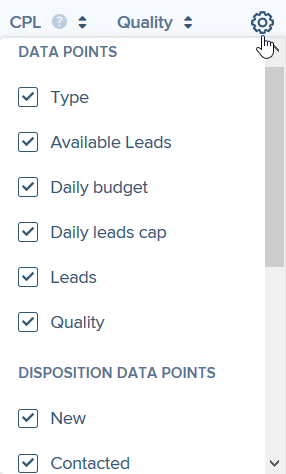 If there’s no disposition data for the selected campaign, 0 is displayed for all steps and the recommendation to upload disposition data. Read more about Sales Funnel.